The concession stand is our biggest fundraiser. It is imperative that at least one representative of each instrumentalist participate on your scheduled night. 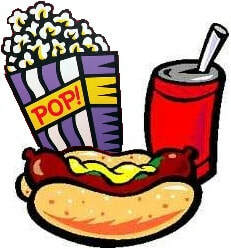 We need about 20 workers for the concession stand to run smoothly. We have the main stand, the Coke wagon and the away side stand to man. It is hard work, but it is FUN! It's a great opportunity to meet other band parents as well! If you need more information regarding the concession stand, please contact Laryessa Holmes, the concession stand coordinator at laryessa@sdhsband.org. I signed up to work concessions. What do I need to know? Welcome freshman parents and returning parents. Below you will find some helpful information pertaining to one of our MOST IMPORTANT fundraisers in the band program, the concession stand. We are blessed to have the opportunity to run the concession stand during the football season and it is one of our primary sources of income for our general fund. o Each section is assigned one home game at which the parents are expected to work. It is VERY IMPORTANT that you show up to work your appointed time. We know there may be a conflict at times. Please let us know if you cannot be there, so a replacement can be found. You may come and help out at another time to make up for your missed game. We encourage you to come back to offer a break for the parents on other nights as well. Sometimes a few moments away is needed to catch your breath! o Friday morning prep – We come to the concession stand on Friday mornings to prep for the evening home games. A LOT of work goes into making sure we are ready for Friday nights and we would love to have you join us! We always have a lot of fun and it is a great opportunity to meet other band parents. This is voluntary and does not exempt you from your game night shift. o Game night shift – On the night you are scheduled to work, we need you here as early as possible. There are several tasks that have to be done before the game and once the grill gets going, we have lots of hungry customers! We ask that you be here as early as 4:00pm but NO LATER THAN 5:30pm on your scheduled night. At that time, we begin to wrap food and make final preparations before the game begins. o Meeting customers’ needs – it is always our goal to keep customers happy! Sometimes on a really good night, we simply run out of things. It happens. Please, don’t panic. It just means we are doing a good job! Please politely suggest an alternative. Remember, we are representing the SDHS band and we want to remain positive and friendly at all times. o We are all on the same team. Let’s help and support each other. No job or role is any more valuable than any other. We need each other to make this work. Let’s be friends! o Have fun! Make new friends. Get to know the other parents and the exceptional young men and women that make up the Marching Trojans. Be proud to be a part of this organization. Use your time, talents, gifts and abilities to leave it better than you found it. I promise you, you’ll never regret the time you spend helping out, building up, nurturing, chaperoning, feeding, cheering on, believing in and growing to love these kids.